Understanding how material is separated from itself to form managable chips with Destiny End Mill geometry allows you to run faster and achieve longer tool life. One of the first things many people notice is the multiple rake faces on our tools. Think of these as first, second and third gear in your car. When you read our speed/feed charts you will see that we have several recommendations for our tools. That’s because, unlike most end mills on the market, our tools are designed for elevated chip loads. This is particularly true in non-ferrous material applications. Most end mills form 6’s & 9’s by moving down into the rake face into the gullet (center line) of the tool. Our tools are designed a bit differently so that the chip actually forms in the outer rake face of the tool and ejects prior to traveling into the core diameter/gullet of the flute. This is part of the reason why increasing the chip load per tooth on our end mills will often reduce the horse power load of the machine. Less energy is required to form the chip and it reduces the heat put into the cutting tool. Heat is a major cause of cutting tool failure over time, so we developed our tools to remove as much heat in the chip as quickly as possible. Unlike other end mills we have found that chatter is caused by too LIGHT of a chip load per tooth. INCREASING the chip load per tooth will eliminate most chatter problems! 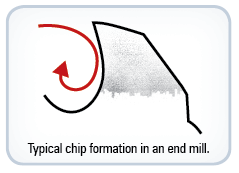 Chip formation in most all end mills on the market have used the horsepower and torque of the machine spindle to force the material being machined into "6" & "9" shaped chips. The shapes are the look of the curled once the tool has forced the material to separate from itself. This means that an awful lot of heat is transferred to the cutting tool as the from the friction created as the chip travels down the gullet of the end mill to form this "6" and "9" shapes. 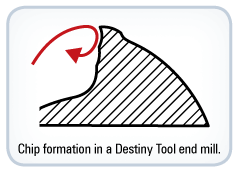 Destiny end mills also form a manageable "6" and "9" shaped chip by traveling down through the gullet to the core diameter of the end mill. However, we have developed a rake face geometry that enables the material to curl in the outer rake face as you can see by the red arrow above. By doing this we create much less friction (and HEAT) in the tool which translates to longer tool life. More importantly, once the chip "lifts" (starts to form in the outer rake face instead of at the core diameter) the HP drops DRAMATICALLY. As you can see from the diagrams above, we depict how our tooling geometry on our end mills can have up to 3 rake faces on the cutting edge of the tool. As the tool enters the cut and takes the first 3-5 revolutions (and remember you can be running up to 18,000 Revolutions Per Minute) to create a fully formed 6 or 9 shaped chip. 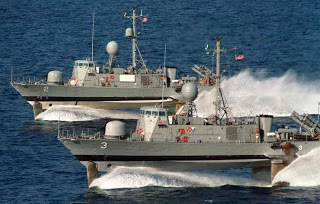 When a hydrofoil starts off from the dock it's not up to speed so it requires both HP and torque until the hull of the boat lifts off the surface. 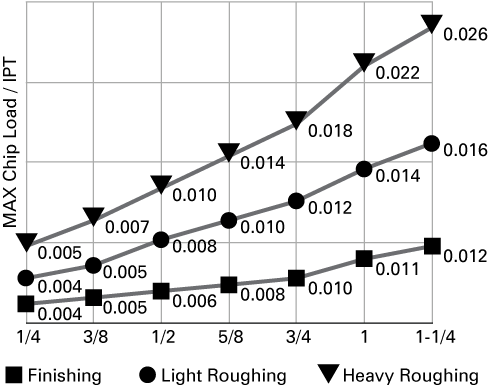 At that point a couple important changes happen in power consumption because the ship has "lifted" from the surface: The coefficient of friction has dropped dramatically. Similarly, once our tools are "in the cut" the chip formation "lifts" from contact with the gullet of the tool (the 'core diameter") and the HP load drops pretty dramatically. One of the most common causes of chatter with our tools is running tools with TOO LIGHT of a chip load. Most chatter problems can be fixed by INCREASING the chip load per tooth (IPT) and SFM. Our tools like to be FED hard and run FAST! If you're hearing chatter or seeing it the likely cause is that your Chip Load is TOO LIGHT or your RPM TOO SLOW. Go Faster!